One of the first reprints published by the wonderful Purple House Press, it's also the first in a series of three Miss Suzy books. Sadly, the other two haven't yet had the reprint gods shine down on them. One of Loganberry Books' most requested titles, I love that fact that there are publishers out there whose sole purpose in life is to resurrect the long lost and loved. Do the folks at PHP a favor and buy their books often. It's up to us to keep these guys afloat so that they can continuing pulling great books from the brink of extinction. That said, I was lucky enough to score a first edition a few months back (and if I can find our PHP edition someday, I'll put that up for grabs in the give), and it truly is priceless. The colors and the matte finish. Really, any picture book with a matte finish is charmed for greatness in my book. I just love the way it feels in your hand. Like something important. 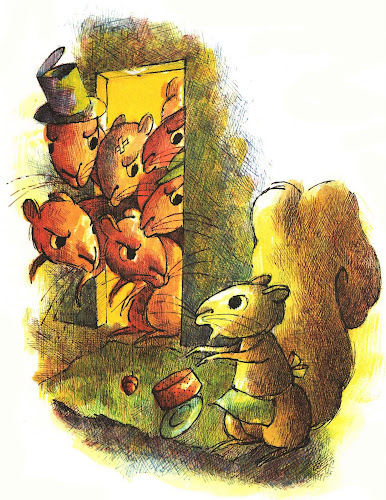 But I digress... For those unfamiliar, Miss Suzy is the story of a little squirrel with a big housing problem. I guess I'll make an acorn cake. 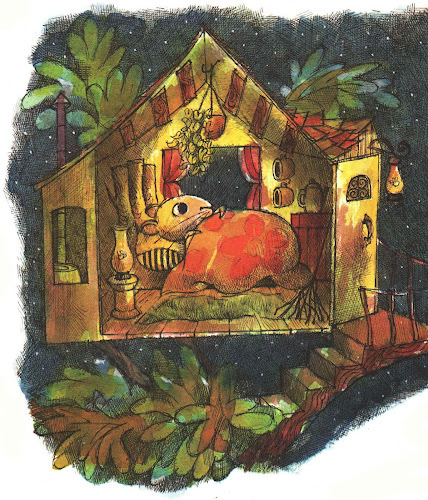 Yes, everything is marvelous in her little tree house until a band of red squirrels evict her and trash her peace pad. She takes shelter in the attic of a neighboring home, and there she finds a gorgeous doll house and meets a band of motherless toy soldiers. 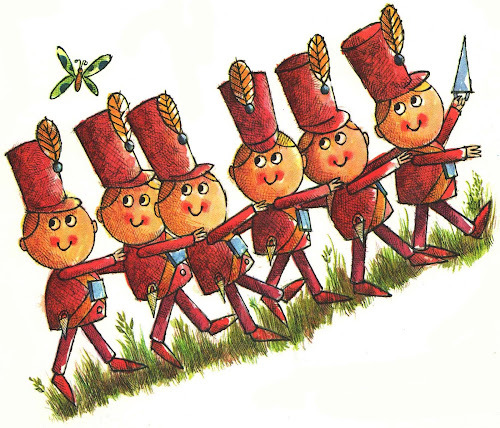 The clan of miniature heroes become so enamored of her cooking and her tucking-into-bed abilities, that they defend her honor in a great battle and all is right with the world again. Such a dear, sweet story both in text and pictures, and so glad to know that another generation is getting to fall in love with Miss Susy's mad kitchen skills. Ah, I remember this from my childhood. My sister's going to be stoked when she sees this. If she remembers it, anyway! We love this book in our home! I'm glad you're introducing it to readers who may not be familiar with it. Oh, thank you for reminding me of this one! I recently found "Miss Suzy's Easter Surprise," and it reminded me that I'd had "Miss Suzy" as a child...but I couldn't remember what it was about--just that I loved it. Now I need the other two! Those kinda words make me so happy! We love this one, and the other two too, from our library. I'm going to look for a vintage copy of this--I know exactly what you mean about the feel of matte books. Thanks for sharing! This was one of my favorites growing up, and one of the first I bought for my daughter. I had no idea there were sequels! i found your blog via ohdeedoh and i just love it...being an english major and future teacher has made me obsessed with children's books. anyways, i just recently learned about parents magazine press books, and i agree with dolly, the ones i have read so far are great! It's a lovely story, I like Miss Suzy's character. She is contented with the simplicity in life. It's very inspiring. Kids will definitely love this book, just like how it has been appreciated for many years. I've only read "Miss Suzy's Easter Surprise"... it was one of my favorites to read at Easter time. Glad too see so many folks feeling the love on this one! Great minds think alike. I requested this book from our library last week because I was looking for dollhouse reads. 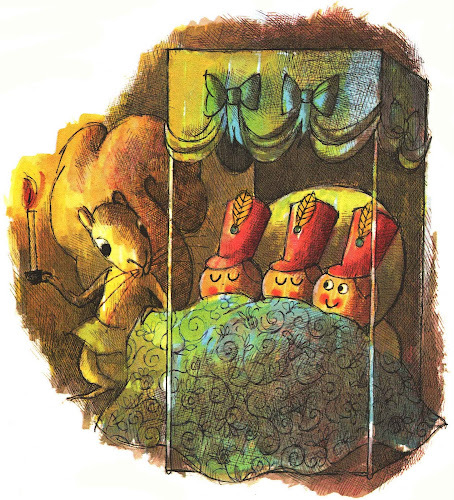 Cute squirrel book. 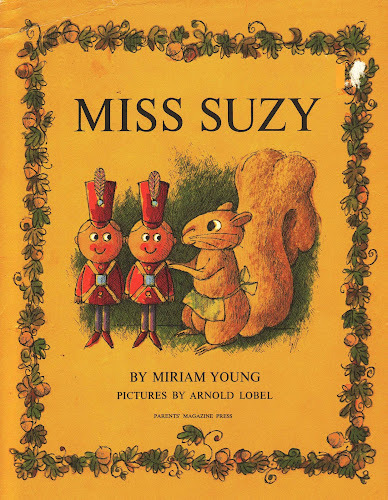 We used to LOVE Miss Suzie as kids! One of my all time favorites. I found your blog from my mom's blog, http://goodbooksforyoungsouls.blogspot.com. Thanks for sharing your love of reading! we have this book. it was given to us by my aunts out of my grandma's basement. i absolutely love it! I'm trying to find a vintage children's book, "Susie Mariah." Each time I search for it, I get information about this "Miss Suzy." Does anyone out there know about "Susie Mariah?" My favorite book as a little girl. My mother gave this book and Never Tease a Weasle to me for a gift about 10 years ago. Just read themn to my kids tonight!!! Still love Miss Suzy! 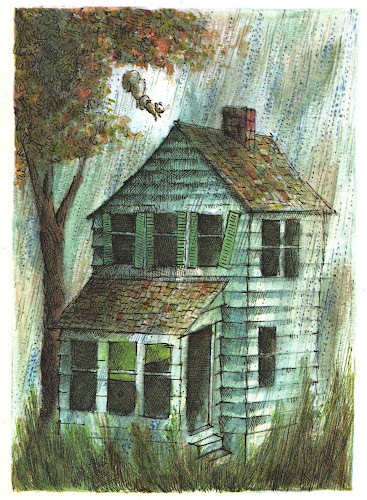 This was my most favorite book when I was a little girl, loved it!